DD Form 2920 or the "Dod Milspets Transfer Of Account Document" is a Department of Defense-issued form used by and within the United States Army. The form - often mistakenly referred to as the DA form 2920 - was last revised on December 1, 2008. Download an up-to-date fillable PDF version of the DD 2920 down below or find it on the Department of Defense documentation website. PART I - FUEL INVENTORY STORED IN TANKS, BLADDERS, SCATS, ETC. Enter the Stock Point DoDAAC. Enter the date of the physical inventory (MM DD YY). Part I - Record Fuel Inventory in tanks, bladders, SCATS, etc., in Part I of this form. Enter the three digit product code for each column. Use a separate column for each product of product recorded on individual sheets. along with the corresponding quantity from the certified tank gauge/strapping chart for each tank in the appropriate product code column. Repeat entry for each tank recorded on the form under the appropriate product code column. column. Repeat entry for each tank recorded on the form under the appropriate product code column. recorded on the form under the appropriate product code column. Lines 4a through 4e: Follow instructions provided for lines 3a through 3d above for all tanks. Enter the total net fuel quantity for each tank recorded on lines 3e and 4e for each of the columns. Part II - Record DWCF Fuel Inventory stored in Refueling Units and Fuel Transport Vehicles in Part II of this form. Enter the product code for refueling unit inventory. Repeat entry for refueling units of each grade of product. units for each grade of product in the appropriate product code column. Enter the observed fuel temperature, API at 60 degrees Fahrenheit, and appropriate conversion factor from applicable API tables. Repeat entries for refueling units for each grade of product. product stored in refueling units and enter result in applicable columns. 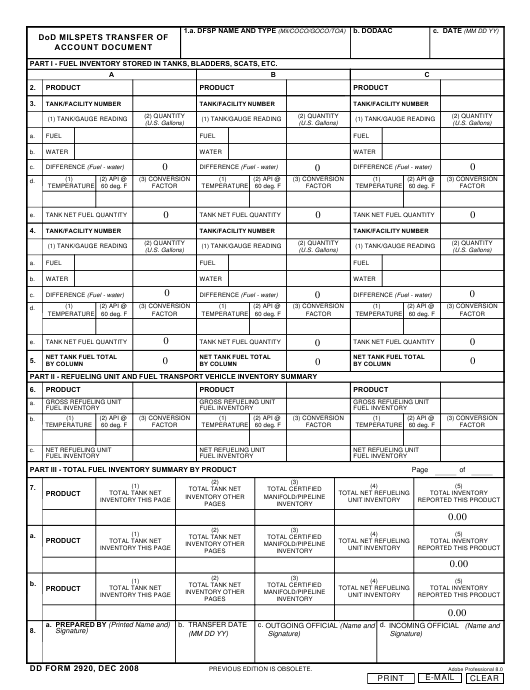 Part III - Summarize Total Fuel Inventory reported by grade of product in Part III of this form. Enter page numbers as appropriate. Inventory + Net Refueling Unit Inventory) and enter result as "Total Inventory Reported This Product". Lines 7a and 7b: Repeat entries and computations as discussed in line 7 for each grade pf DWCF fuel inventory. Enter the printed name of the person preparing the DD Form 2920.
and signature of the person preparing the DD Form 2920. May also be digitally signed. Enter the date of the account transfer from the outgoing RO/PA to the incoming RO/PA (MM DD YY). Enter the printed name of the outgoing RO or PA. The outgoing RO or PA must sign above their printed name. and signature of the outgoing official. May also be digitally signed. Enter the printed name of the incoming RO or PA. The incoming RO or PA must sign above their printed name. and signature of the incoming official. May also be digitally signed.